Let’s have an example, saying, we are after sourcing professionals from Poland. Rather than going for #in Advanced Search and trying to apply a string I look for a person who is either based out of Poland or a Polish recruiting LION or having a large global/regional recruiting/sourcing network. I use this link. It brings the network of that one person only and I can now better use the #in filtering options. I remove all mutual (1st level) connections assuming I already know and have re-connected with them. Now I go for the location or add any new keywords or filter a company to narrow the results. Here we go! I can now search everyone who I may have missed before! At the end of this link replace the id with your connection’s id (pic below)! Note that you cannot x-ray a network if someone has hidden their #in connections from you. Many thanks Balazas.. and also thanks Irena..
Am I doing something wrong? I’m not able to see anyone who is not a 1st connection of my own? Looking at Balazs link I am only able to see the 59 people we both have as 1st connections. I also tried Irinas example by looking at her super connector Ron Bates where Irina is getting 42,6312 results I’m only getting 74 shared connections. I’ve tried this search looking at my own LinkedIn ID and it works really well as a way to search my own connections. 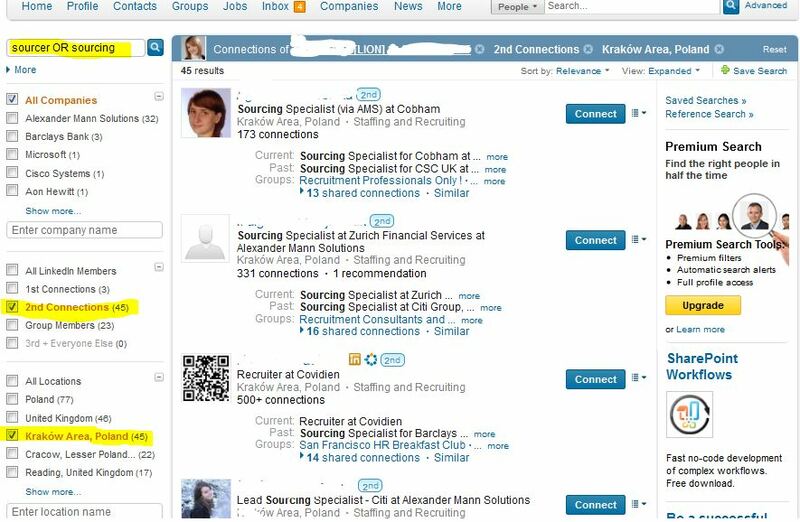 I’ve also tried to use your method -> I used this link: http://www.linkedin.com/search/fpsearch?viewType=cc&ccId= and in the end I added the ID of the profile whose connections I wanted to see (2nd degree connection with me), I got over 1 million connections…and the message to type in a key word if I want to see people outside my network. I think I am doing something wrong or I didn’t understand the logic very well…I would be really grateful if someone shared some more insights with me. Thank you! Hi Ana – by using this link (http://www.linkedin.com/search/fpsearch?viewType=cc&ccId=29667417 – this is your ID) I can see all the shared connections between you and me (9 ppl). I also checked the link with Irina (http://www.linkedin.com/search/fpsearch?viewType=cc&ccId=1769200) and for me it still gives all the right profiles. Can you please try these links, too?